Valerie H. Marshall: Stampotique's Spring Release Blog Hop! Stampotique's Spring Release Blog Hop! If you are a fan of the Stampotique Facebook page you may have already gotten a sneak peek of some of the new images we are excited to be releasing today. We hope you will join us for the blog hop to see a variety of those images. There are lots of new images from our favorite stamp designers and we are proud to welcome one of our newest stamp designer, Magda Polakow, whom you have seen tons of her fabulous creations here as part of our design team. We think you will find a few stamps that you can't live without. This project features just a few of my favorites! Join us commenting through the blog hop for your chance to win some random goodies-we will be randomly drawing two winners for a $30 gift certificate for Stampotique stamps at the Stampotique online store. The new stamps should be available over there now. Also, make sure you hope all the way through for an exciting announcement on our Stampotique Designers Blog for an additional chance to win some goodies and some additional recognition as an artist. Hopefully, you've landed here from Roc Nicholas' blog and will continue on your way over to Kaz Boughton's blog from here. Have fun hopping, we will be pulling the random winners of the blog at our next challenge on April 23, 2014! Great work Valerie, love it! what a great card, fantastic combination of the new stamps! Great card ... The dog is great! I love your project! Your combination is AMAZING! You have used some of my fav stamps so far too! Great project - love the black and white dog on the colourful background. He's a cutie! A dog in a cage? = fabulous! Your colors are so pretty and a wonderful background for the stripey dog. Fantastic sentiments! I love the dog in the birdcage! Omg..this is awesome! Love that you used a few of my new stamps, too! Great colors! Gorgeous! Fabulous colours, and the doggie is so sweet! So funny, loved the card! Happy hopping, Valerie! You have put together 3 stamps that might seem, at first, to be an unlikely combination...but, it ended up being pure genius! Love the message created by your art today! Really cute, loving what you've done with the new stamps! Brilliant, clever, and funny way to combine those three stamps! There's something so disarmingly charming about putting other animals into a bird cage! Wow, you put a lot of thought into this! It's BRILLIANT!!! I love the dog in the cage has jail stripes. It's perfect with the journal stamps! I LOVE it!!! Simply gorgeous card, vibrant colours! Love this project! What a great idea not to use a bird image with the cage. This one is much better! 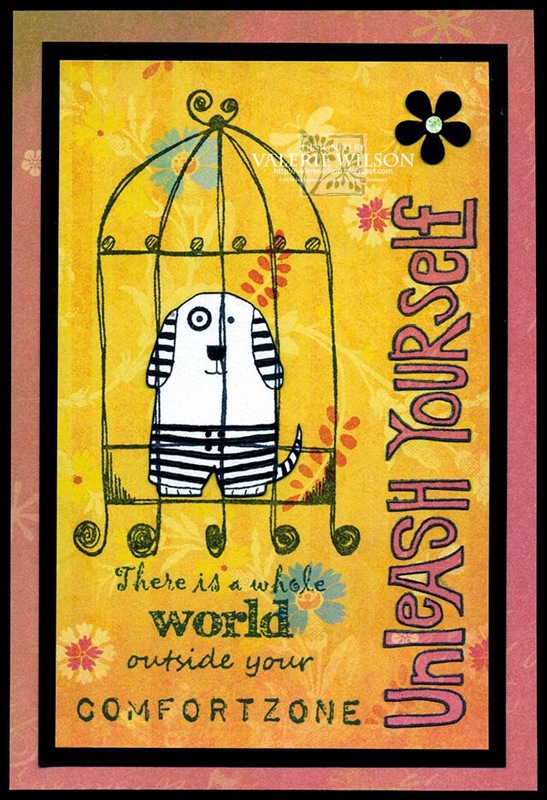 What a great card with some of those fab new stamps - I love the comfort zone quote! How adorable is this card! Love the doggie in the bird cage! Love your card - wonderfully colorful and great sentiments! What a gorgeous piece of artwork. Love the new stamps. Thanks for the HOP and a chance to win some Stampotique bucks. Love your page, and the way you used the dog in the birdhouse... Love it! Great card! Love the way you used that cute little dog. Fab!!! I love your project Valerie, great colours! why didn't I get the unleash yourself? Love how you used it on this card! Love these stamps-especially the bird cage! Great use of color! I just love your Project. The striped dog is so funny! What a great new stamp! Love what you did with it! fantastic saying about outside your comfort zone. I love your saying about your comfort zone!